CCS LAUNCH NEW PE UNIFORM. 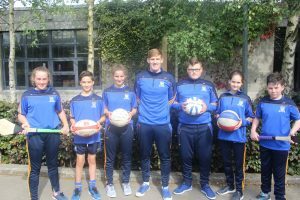 Cashel Community School have launched a new PE uniform for the 2017/2018 academic year. The uniform which is compulsory for 1St Years and optional for other years in the school while it is phased in is an O’Neill’s sportswear range. The new design is the outcome of a lengthy consultative process between students, parents and staff. The sportswear range is dominated by the school colours blue and gold. All items can be purchased from the O’Neill’s website. Left to Right: Kelli Browne, Benjamin Borowski, Lisa O’Connor, Mr. Richard Ryan (PE Teacher), Viktor Csanyl, Ema Gerashim & Jamie Doyle.